The current challenge at Cards In Envy is to creat a card using your punches or dies. 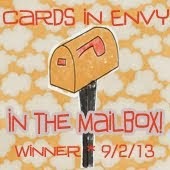 Now I just love my punches so this card was easy peasy. I used my diamond and snowflake punches to create the poinsettia. A little foam was used to add a little dimension. I need a couple of thank you cards for work so these will be perfect. Most of the papers are DCWV. Cute thank you card. Love the pink and green color combo and the punched out flower. Thanks for playing along with us at Cards in Envy. Love this! Fabulous poinsettia! 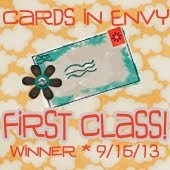 Thanks for sharing with us at Cards in Envy! LOVE LOVE the poinsettia!!!! thanks sooo much for playing along with Cards In Envy!! !